Most of us remember our first camping trip with both good and bad memories. Who can forget Dad struggling to set up the tent, eating outside, roasting burnt marshmallows, swatting away mosquitoes and sleeping on the uncomfortable ground in the dark, as well as having to use an outdoor loo – or bush? Now you can repeat the experience – with your own kids! 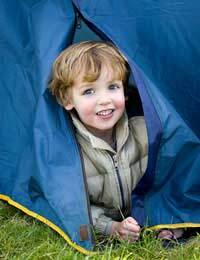 Whether you camp in a tent or a caravan, camping outside is an important rite of passage for a child. The smell of the campfire, the starry night sky and the sound of rain falling on the tent or caravan roof are memories that stay with us forever, and in most cases, the experience brings the whole family closer together. Summer is a great time to take your kids camping for the first time. Prepare them in advance for what to expect, especially if they are little, and talk about the fact they may encounter a lot of insects or hear unusual outside noises at night. However you feel about camping, let them know this is a Big Adventure – and is bound to be fun! Sleeping bags/pillows. Make sure the sleeping bag is warm enough and that the pillow is suitably comfortable. Mattress. Either a foam one like a yoga mat, or an air mattress. Don't forget the pump! Torch. Very important for nighttime toilet expeditions in particular. Food and drink. If you plan to cook on a camp stove, don't leave the matches at home. The right clothes. Nothing says “I want to go home” quicker than soggy clothes and wet shoes. Check the weather forecast first and bring appropriate clothing, plus dry clothes to change into. Mosquito repellent/first aid kit. Enough said. Cuddly Toy. If Junior cannot go to sleep without his favourite teddy, don't leave it at home. Take in the scenery, and draw pictures of the landscape. Do some nature arts and crafts. Sing campfire songs and roast hot dogs and marshmallows around the fire. Bring new colouring books and invite the kids to get stuck in. Tell scary ghost stories... if your kids can handle it! If camping seems to be too much of a hassle for you, why not try camping in your own back garden at first? You won't have to pack much, drive to your chosen destination or worry about the outdoor toilet. And if a child gets homesick, you can always sling them back in their very own bed. Pick an evening when everyone is free, preferably when no parent has to work the following day. Either pitch a tent in the garden or put a blanket over a clothesline, then line up the sleeping bags inside. Have your own backyard BBQ in a safe portable grill, then tell ghost stories and bring out the marshmallows. If all goes well, you could eventually graduate to a real campsite.